If it were Black to move it would be simple... Black is in zugzwang, so whatever move he makes leads to a win for White. But what if it were White to move? Can White force a win in this position? 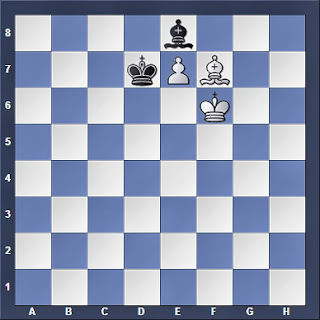 Back in June we touched upon the topic of opposite-colour bishops in the endgame and how they usually give drawing chances for the weaker side. So now, in order to gain a better understanding of how to solve the position above, we will look at the topic of similar coloured bishops in the endgame. Over here White has winning chances. Black wants to force a draw by leaving his bishop along the a5-d8 diagonal, thus controlling the queening square-- he can get a draw so long as he manages to trade off his bishop for the opponent's pawn. White, on the other hand, need to find a way to chase the enemy bishop away so that his pawn can queen. 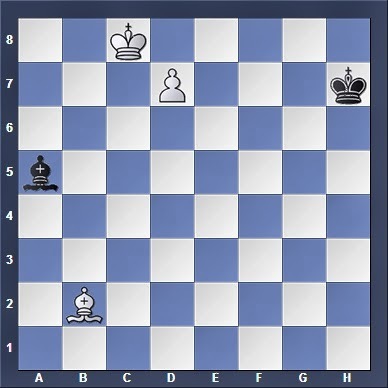 The White king cannot cover all the squares along the a5-d8 diagonal, so he needs the help of his bishop. The king and bishop work together to block the diagonal, thus allowing the pawn to queen. Notice how different this is from a position with opposite-coloured bishops-- over here, the stronger side can utilize his bishop to force his own pawns over squares covered by the enemy bishop because they are on similar-coloured squares. Also, we can see that in the above position, Black's king is too far away to participate in the struggle. Black's plan is still the same: Occupy the h4-d8 diagonal and prevent White's pawn from queening. But for White, things are now not so straightforward because White's king is on the wrong side of the pawn, so it cannot work with the bishop to block the h4-d8 diagonal. Even if he were to attempt maneuvering his king to e8 in preparation for Be7, Black will simply switch to the other diagonal with Bd8-Ba5 (and possibly even get his king in to join the fray), making things awkward for White. Thus White will have to adopt another method: Chasing the Black bishop away from the h4-d8 diagonal, and onto the shorter a5-d8 diagonal where it can be blocked with the help of the White king. 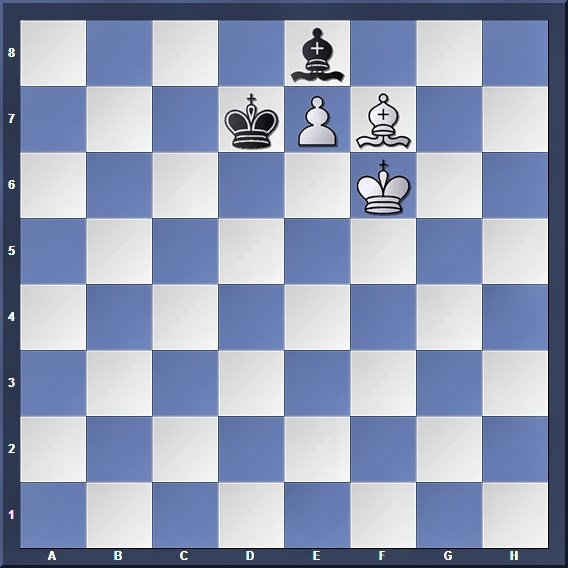 Forcing the Black bishop out of the diagonal. And now Black cannot stop the threat of 5. Bc7, returning to our first example. In our earlier two examples we have seen that the weaker side's king was far away from the fight and thus was not able to provide any help. So what happens when we place the defending King right in the middle of the action? And White suddenly finds that he can no longer play Bc7, because both the enemy king and bishop cover this critical square! Now, if he were to try and force the Black bishop away again with Bf6-Bd8, Black will just quickly switch his bishop over to the other diagonal (while exploiting the fact that the White bishop blocks the pawn from queening while after Bd8). Meanwhile, while White is going around trying to do his own fancy maneuvers, Black can simply shuffle his bishop along a5 and b6 (i.e. 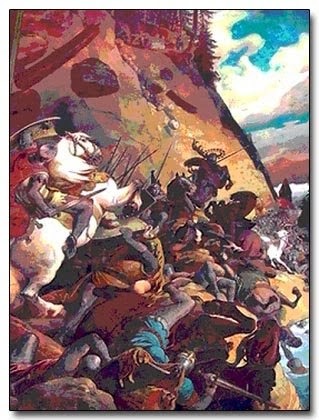 shuffling along the diagonal) whenever he requires waiting moves, and thus will never run into zugzwang. Lastly, note that White's king is frozen because it needs to defend the d-pawn. What happens if we shift everything one square to the side, such that the central pawn becomes a bishop-pawn? Yes, it makes a difference-- White can now win in this position! And suddenly Black realizes that he is in zugzwang! Moving the bishop off the a6-c8 diagonal allows the enemy pawn to promote, while moving his king to any legal square allows 6. Bc7. Unlike the previous position, he cannot do his "shuffling" trick along the a6-c8 diagonal, because moving to the other two squares along the diagonal will result in the hanging of the bishop. Simply put, White won as the diagonal was too short for Black to perform his "shuffling" trick. Thus, in positions featuring pawns which are closer to the side of the board (i.e. 3 files or less), the stronger side can force a win by forcing the opponent's bishop onto the shorter diagonal, before landing him into zugzwang. True exploitation of the terrain indeed! Black will get his king back to c6, but does not do so immediately as 3... Kb5? is met by 4. Ba7! 3. Be3 Bd6 4. Bg5 Kb5 5. Bd8 Kc6 6. Be7 Bh2! And suddenly White finds that he cannot play 7. Bc5 (in an attempt to play 8. Ba7) because of 7... Kxc5! So now we see why 3. Bc5 was the only way to win-- it prevents 3... Bd6 by forcing the black Bishop to move to with g3, f4 or e5. On these squares White can then challenge via Bh4, Bg5 of Bf6, upon which he will be safely away from the enemy king (which is on c6). In contrast, allowing 3... Bb6 means that Black's king will get in the way while White is trying to maneuver his bishop to a7. 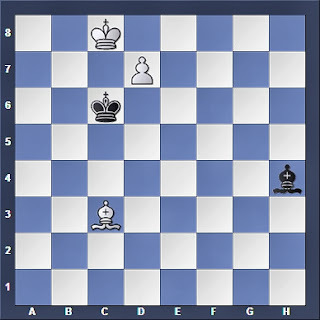 As such, Centurini postulated that in such positions where both kings are directly opposing each other, the weaker side can force a draw if his bishop has at least two free squares to move to on both diagonals. 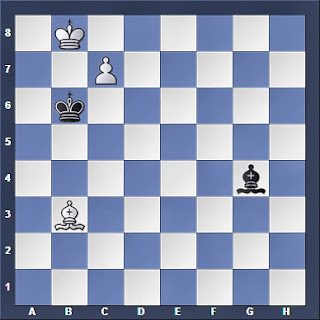 On the other hand, if one of the diagonals has less than two free squares for the defending bishop, then the stronger side can usually win by forcing his opponent into zugzwang. What can we infer from this theory and the examples shown above? Simply put, in positions featuring similar-coloured bishops with the weaker side's king directly in front of its counterpart, the game is usually drawn if the stronger side's pawn is a central (king or queen) pawn. 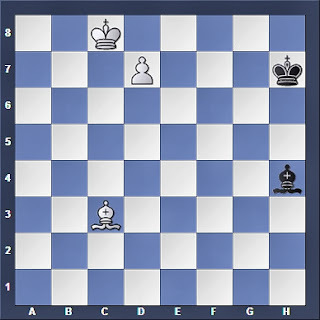 However, if the stronger side's paw is a wing (bishop, knight or rook) pawn, then he can usually force a win as there will be one diagonal upon which the defender has few safe squares to move to. 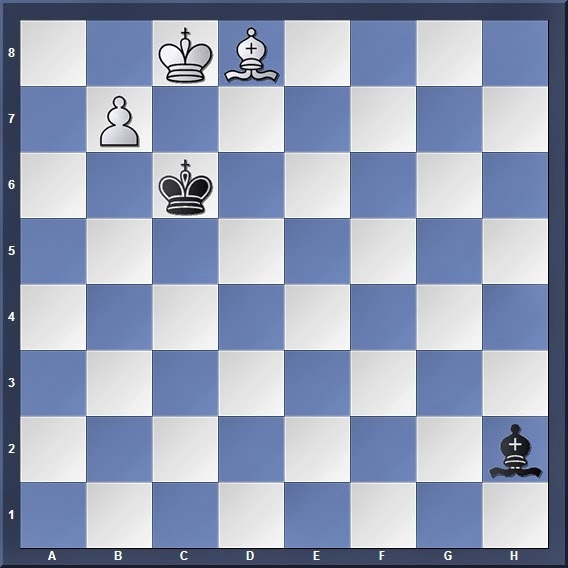 White to move... can he win? The old "shuffle" trick. And NOT 2... Kd7?? 3. Bb5+! with an instant loss for Black. In bishop + pawn vs bishop of similar colour endgames, where the pawn is on the verge of promotion, the stronger side wins if the weaker side's king is too far away from the main action. In similar positions where the weaker side's king is directly opposite its counterpart and playing an active part in the defense, a draw occurs if the pawn is a central pawn. This is due to the facts that the weaker side's bishop can switch freely between the two diagonals to prevent the pawn from promoting, without fear of running into zugzwang. 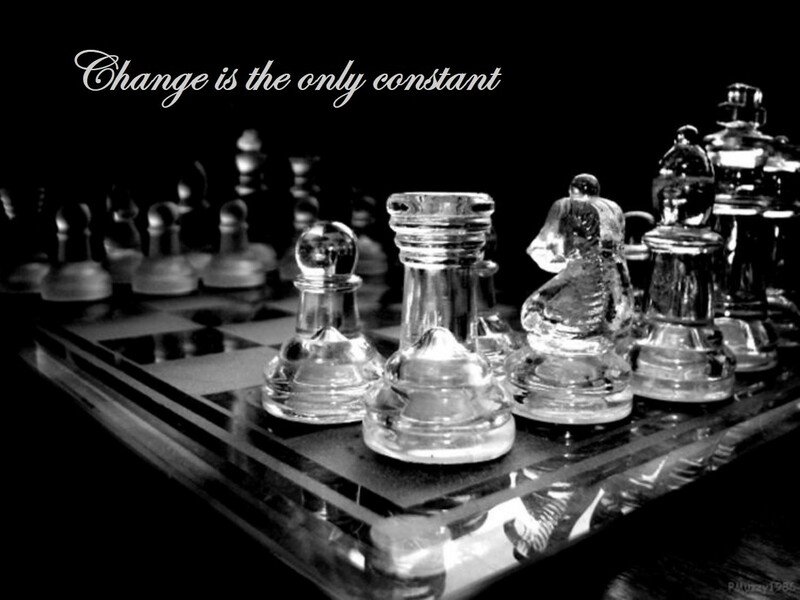 However, if the pawn is a wing pawn, then the stronger side usually wins. 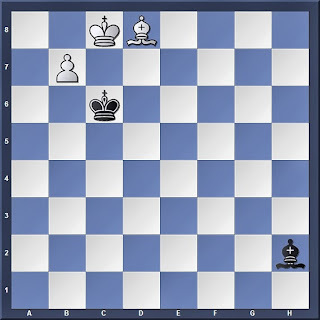 By exploiting the fact that one of the diagonals is too short with few squares (less than two) for the enemy bishop to run to, then he can force his opponent into zugzwang. 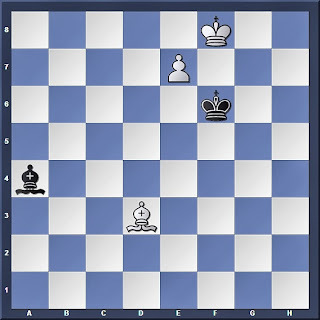 In Part 2, we will take a more in depth view of endgame positions featuring bishops of similar colour.